Once widespread across eastern North America, Pumas now only survive in a small isolated population in south Florida, where the Florida Panther is protected under the Endangered Species Act, but essentially walled into the southern part of the state by the Caloosahatchie channel and development alongside. Floridians are proud of their Panthers; and direct persecution is no longer the problem. Habitat isolation and roads and cars are the main threats to their survival. In bad years, twenty or more of the elusive cats are killed on Florida’s busy roads – this despite Florida’s exemplary efforts to install safe wildlife crossings on major roads. The wildlife crossings are still too few and far between; and many roads still completely lack them. 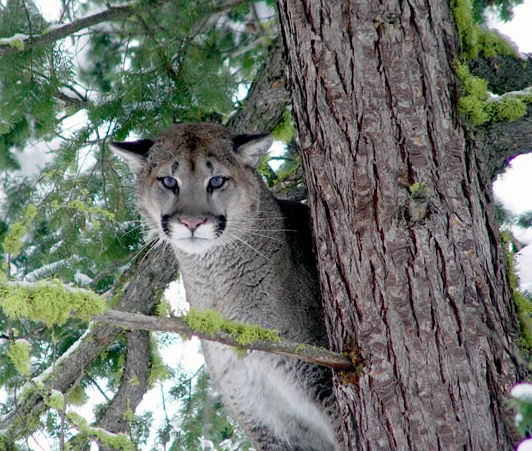 Meanwhile, across the rest of the East, the US Fish and Wildlife Service has declared the “Eastern cougar” extinct. This is a doubly unfortunate decision. First, it is biologically unsound, as the latest taxonomic information suggests that all native North American Pumas are of one subspecies; the other five subspecies being Central and South American. So in effect the FWS posited a fictional subspecies then declared it extinct, so as not to have to address the need for Puma recovery in the East. 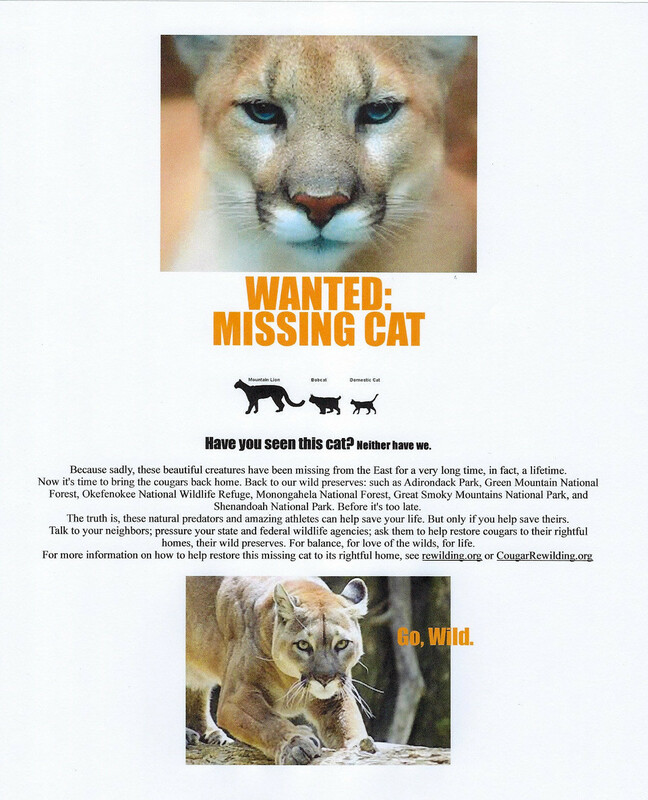 Second, FWS’s declaration of extinction for the “Eastern cougar” may make recovering the great cat in the East more difficult., though paradoxically, it may open the door for a progressive state to reintroduce Pumas unilaterally. Rather than using the Endangered Species Act as a tool to protect and restore biodiversity, FWS seems to be using it as a tool to discourage restoration. Fish & Wildlife officials should instead acknowledge the ecological importance of Pumas, West and East, and strive to restore viable populations of the big cat wherever ample cover and prey remain. Doing so would be consistent with the intent of the Endangered Species Act, even if the Puma as a whole species is in no near-term danger of extinction. Regional extinction of the keystone predator is causing untold ecological losses, which FWS ignores to its discredit. 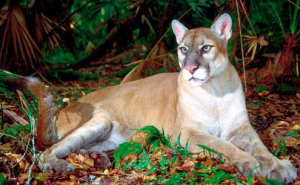 A pressing need for the Florida Panther is to expand its ESA Critical Habitat, to expand its recovery range to wildlands northward in Florida, Georgia, and beyond. Ample habitat and prey remain in the Florida Panhandle, the Ocala to Osceola to Okefenokee (O2O) connection, South Carolina’s Cape Fear Arch and ACE Basin, North Carolina’s Albemarle Peninsula, and in other relatively undeveloped parts of the Southeast Coastal Plain. Connections through the Piedmont are more dubious, so habitat restoration as well as safe wildlife crossings will be needed in the Carolinas’ foothills. Once in the Appalachians, Pumas should be able to spread north and south along the mountain range, if fully protected under the ESA. So far, though, federal and state wildlife officials have lacked the courage to reintroduce Panthers farther north in their original range, excepting an experimental release of sterile Pumas from Texas in southern Georgia many years ago – which experiment showed the big cats could thrive, but which experiment was canceled for political reasons. With little hope of Pumas reestablishing from within the East, many conservationists turn to the West. Pumas have been trying to recolonize areas eastward from their strongholds in the Rockies, but thus far roads and guns are preventing gains beyond the Great Plains . There are five known small satellite populations east of the main front of Puma occupancy: in the Cypress Hills of southern Saskatchewan, Missouri River corridor of eastern Montana, Badlands of North Dakota, Black Hills of South Dakota, and the Pine Ridge area of Nebraska. For a time, it appeared these revived populations might serve as stepping-stones for eastward colonization. Recently, however, it has become clear that persecution rates are too high for these populations to expand. South Dakota, especially, has sanctioned the annual killing of dozens of Pumas – including females – quelling hopes the Black Hills cats might spread east into the forests of the Great Lakes states. Essential to these long-distance movements are adequate dispersal corridors, and they still exist, tenuously. An Atlantic/Appalachian Wildway from the Southeast Coastal Plain through the Appalachians and Adirondacks to the Canadian Maritimes is achievable in our lifetimes (see Rewilding North America, by Dave Foreman; and Big, Wild, and Connected, by John Davis) – if conservationists can successfully collaborate with conservation-minded land-owners and land, wildlife, and transportation agencies. Much of the Eastern Forest is still permeable to movement of wide-ranging species. A Great Lakes Wildway linking the Northern Forest from Minnesota and Ontario’s Boundary Waters to the Gulf of St Lawrence is also achievable, as is a Gulf Coast Wildway from east Texas through Florida’s Panhandle. Other west-east connections, especially along major rivers, are likewise top ecological priorities (see John Laundre’s book Phantoms of the Prairie for discussion of how and why Cougars often disperse along waterways).